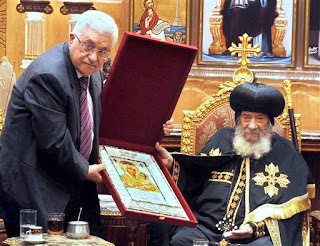 CAIRO : Modern-day Jews are not God's chosen people, said Pope Shenouda III, the head of Egypt's Coptic Orthodox Church, in a statement Wednesday (Sept. 28, 2011) evening. "Do not believe their claims that they are God's chosen people, because it is not true," Shenouda said during his weekly sermon on Wednesday evening at the papal residence in Abbasseya. When there were no believers on earth the Jews were really God's chosen people, but God's chosen people are now all those who believe in the existence of God and carry out all God's teachings, he added. Once billions believed in the existence of God, the Jews no longer were God’s chosen people, he said, and now all those who believe in God and have true faith are God's chosen people. and joy to each one you. The stalemate at St. Peter’s & St. Paul’s Orthodox Valiyappally was one of the most serious issues faced by the Church in recent times. The honorable court had categorically pronounced that the Kolenchery Church, the allied worship centers and the properties belong to the Orthodox Church and they are to be administered in accordance with the 1934 Constitution. But the District administration denied our legitimate right of worship flouting the court order. Under these circumstances, to persuade the government to execute the court order, with firm conviction, determination and reliance on God, we along with H.G. Dr. Mathews Mar Severious , the Metropolitan of Kandanad West Diocese began an indefinite fast. We were compelled to take this extreme step as a last resort when we realized that there was no other way to protest against the denial of justice to the Malankara Orthodox Church and to get justice executed. We glorify the Almighty who strengthen us to accomplish this fast in a victorious way, though the helth conditions of both of us degenerated. The support which you gave to us and our brother Metropolitan H.G. Mathew mar Severious was indeed beyond all our expectation. We express our profound happiness and gratitude to our brother Metropolitans, Priest Trustee Rev. Fr. 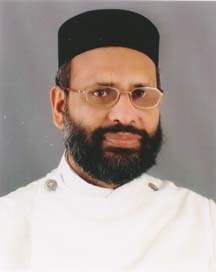 Dr. Johns Abraham Konatt, Lay Trustee Shri M.G. George Muthoot, Association Secretary Dr. George Joseph, Members of the Malankara Orthodox Syrian Christian Association, Members of the Managing Committee, our beloved priests, sisters, office bearers and members of various spiritual organizations especially the Youth Movement Members and above all, our crown and glory the beloved people of the Church who galvanized our strength through their prayer, tears and unconditional support. We remember with gratitude the various religious leaders, leaders of sister churches, office bearers of the Kerala Christian Council and leaders from various strata of the society and all those who responded to this issue as the question of honoring the very existence of the judiciary apart from a simple church issue. We should not forget those who helped us during the hard times of the Church. Those who were responsible and expected to help us, hurt us. In spite of all these, the Almighty strengthened our hearts. God is with us. Each one of you are our strength and fortitude. The sacrifice you endured, the tears you shed, prayers you said before God empowered us and give us robust hope. Dear children, you must love the Church above any political-regional interest. Our prime aim should be the progress of the Church which is our Lord’s Temple, Bride and Body. You should continue to pray for the perfect peace and permanent settlement of this issue of Kolenchry church. As prophet Nehemiah said The God of heaven will give us success. We his servants will start rebuilding, but as for you, you have no share in Jerusalem or any claim or historic right to it." May the Grace and Blessings of God Almighty abide with you forever. And may the prayers of the Mother of our God the Holy Virgin Mary, St. Thomas the Apostle of India, our Holy Fathers Mar Gregorios, Mar Dionysius and all the Holy Saints be a stronghold for us. Amen. 2011 September 27 (AINA): The Egyptian Union of Human Rights Organizations (EUHRO) published a report today on emigration of Christians from Egypt, saying that nearly 100,000 Christians have emigrated since March 2011. The report, which was sent to the Egyptian cabinet and the Supreme Council of the Armed Forces (SCAF), warned that this emigration has been prompted by the escalating intimidation and attacks on Christians by Islamists. "Copts are not emigrating abroad voluntarily," said Naguib Gabriell, the director EUHRO, "they are coerced into that by threats and intimidation by hard line Salafists, and the lack of protection they are getting from the Egyptian regime." EUHRO warned that emigration of Christians out of Egypt will threaten its demographic makeup and national economy. "Copts constitute a strong pillar in the economy." said Gabriel, "Copts who are leaving their homeland are not prompted by their need for work, as they are from the professional and business class, but from fear of the hard line Salafists." Attacks on Copts and their religious institutions have spread fear, according to Gabriel. Recent attacks included the killing of Coptic youths in Moqattam (AINA 3-9-2011) and Embaba (AINA 5-8-2011), cutting-off the ear of a Copt, (AINA 3-26-2011) , attacks on churches (AINA 3-5-2011), as well as preventing the governor of Qena from occupying his post because he is Christian (AINA 5-3-2011)." "Salafist clerics, who gained political influence after the January 25 Revolution, have become emboldened," said Gabriel, "calling Copts Dhimmis who have to pay the jizya (tax paid by non-Muslims to the state) because they are not first class citizens and can never enjoy full citizenship rights, or obtain sensitive posts." On September 12, Yasser Borhami, Head of Alexandria Salafists, accused Christians on a popular TV show of being "Infidels, who live in darkness, because they are away from Islam." His interview enraged Copts "who regarded it as a licence to kill the Christians by inciting Muslims," said Coptic activist Wagih Yacoub. EUHRO filed a complaint against Borhami with the Prosecutor General, accusing him of "defaming a heavenly religion," which is against the constitution and which would "endanger social peace." Gabriel sees a parallel with the Christian emigration from Iraq, Palestine and Lebanon. "After the massacre of the congregation of Our Lady of Deliverance Church on October 31, 2010, and other attacks in Iraq, the ratio of Iraqi Christians went down from 8% to 2%. In Palestine to just .5%, and in Lebanon from 75% to 32%." "If emigration of Christians, who constitute nearly 16% of the Egyptian population, continues at the present rate, it may reach 250,000 by the end of 2011," said Gabriel, "and within ten years a third of the Coptic population of Egypt would be gone." According to Gabriel Copts see a dark future awaiting them in Egypt, especially because neither SCAF nor the government is taking any measures to curb the Salafist violence. "They should bring to justice those criminals who attack the Copts and their churches, instead of letting them get off Scot-free." He called on SCAF to pull the reins in on Salafists and to clearly announce that Egypt is a democratic, secular state, based on equal citizenship for all Egyptians. Cairo, Monday 26 Sep 2011: Egypt’s Coptic Patriarch, Pope Shenouda III, has urged the US to pursue balanced policies in regards to the Palestinian crisis and to support the Middle East process, during a meeting with US Ambassador, Anne Patterson, on Monday. The Pope also asked the US not to destroy the Palestinian dream of having a state recognised by the international community. The Pope made the statement after meeting with the ambassador in the Coptic Cathedral in Abbassiya, Cairo. During the meeting, the Pope also expressed his rejection of any foreign interference in the internal affairs of Egypt, especially regarding the situation of Copts. It was Patterson’s first visit to the cathedral since she was stationed in Egypt last August. The judgment pronounced by the District Court Ernakulam on 16th August 2011 about the administration of the St. Peter’s and St. Paul’s Church, Kolenchery was the verdict on an Original Suit filed by the dissident Patriarchal group (Rebel Jacobite Syrian Christian Church) in 2007 (OS 43/2007) for obtaining the following relief. 1. For obtaining a declaration that the Kolenchery church and its assets are liable to be administered only in accordance with the terms of an Udampady registered in 1913 and not in accordance with the 1934 constitution. 2. To settle a scheme for administering the church and its assets and its institutions. 3. For getting an order from the court to appoint a receiver who may prepare a voters list of all the parishioners and conduct fresh elections to the managing committee. 4. To issue an injunction prohibiting the handing over of keys of the church to Fr. Jacob Kurian, the vicar appointed by H. E. Dr. Mathews Mar Severios. The court after considering the various issues passed a verdict on these crucial issues as follows. 1. Whether a declaration that the church is administered by the 1913 Udampady is allowable? The dissident patriarch’s party’s main contention was that 1934 constitution was not accepted by the Kolenchery church. The judgment says that the Supreme Court (SC) judgment 1995 upholds the 1934 constitution and there is no mention that each parish should accept this constitution by convening a general body of the parishioners. This means that each parish of the Church is bound by the SC judgment to accept the 1934 constitution. No special decision of the parishioners is necessary for this. The SC verdict is applicable to the Kolenchery church even if the church was not a party to those suits. So the verdict clearly says the dissident Patriarch’s group even cannot contend that the 1934 constitution is not valid and not applicable to the Kolenchery church. So it cannot be declared that the church should be governed by the 1913 Udampady. 2. Whether a scheme of administration has to be settled? The dissident Patriarch’s party claimed that after 1972 elections were not held to the managing committee of the parish and the governing body of its institutions. The Orthodox Church argued that elections were held regularly according to the 1934 constitution, and such elections were recognized by the metropolitan. Evidences of such elections were produced before the court. The verdict says that the stand of the dissident Patriarch’s group cannot be accepted as it is against the SC finding. “First of all they have to accept and recognize 1934 constitution and then only their prayer for conducting election to committees can be considered. There is no question at all to frame a scheme (for administration) when 1934 constitution is in existence and when it is held valid and applicable to the 1st defendant (Kolenchery church)”. Thus the court dismissed their prayer to settle a scheme of administration. The judgment further says that “the parish members in the church has right to decide regarding the administration of the properties and the educational institutions under it. But as stated earlier, only when the plaintiffs (dissident Patriarch’s group) or other members in the dissident Patriarch faction accept and recognize 1934 constitution, their contention can be entertained”. So the point is answered against the dissident Patriarch’s group. 3. The court also considered whether election to managing committee has to be conducted by a receiver. The finding of the question in No. 2 does not allow for such an action and thus it was not allowed. 4. The plaintiffs prayed for an injunction to restrain Fr. Jacob Kurian and his agents from receiving the keys of the church. No such injunction was allowed. This order is very important for the future litigation of the Church. It upholds the SC verdict and affirms that the 1934 constitution is binding on the parish churches. The basic contention of the Patriarch’s group that the SC judgment is not binding to the parishes is quashed. The verdict says that those who do not accept the 1934 constitution do not have any claim on the administration of the church and its properties. By asking to hand over the keys to Fr. Jacob Kurian the court has recognized the authority of the Metropolitan (H. E. Dr. Mathews Mar Severios) who appointed him over the administration of the church and its properties. The original suite (OS) which culminated in the present judgment was filed by the dissident Patriarch’s party in 2007. During the pendency of the OS both parties (The Patriarch’s party as well as the Orthodox Church) filed IAs seeking interim relief. Both the IAs was heard together by the District Court and an order was given in 2 – 12 – 2010. According to this the court ordered that the church be opened. The Orthodox Church can celebrate Qurbana on two Sundays and the patriarch’s party may be given freedom to celebrate Qurbana on every third Sunday. The keys were to be given to Fr. Jacob Kurian who was recognized as the rightful vicar of the parish and the administration has to be carried out by the existing managing committee which was elected by the Orthodox Church according to the 1934 constitution. This arrangement was fixed till the disposal of the OS. According to this order the Kolenchery church was opened once again in 2 – 12 – 2010 and we took possession of the church and its properties. The maintenance work of the church was initiated. The patriarch’s party had no other right except to celebrate liturgy every third Sunday. The patriarch’s party filed an appeal in the High Court challenging this interim order. But the High Court did not give them any additional relief but directed the district court to dispose off the OS within 2 months. Thus the District court took up the matter and issued the judgment on 16th August 2011 and H. E. Dr. Mathews Mar Severios Metropolitan celebrated Holy Qurbana at Kolenchery church on 17th August 2011. The dissident Patriarch’s party approached the same court for a stay order. On 18th August the same District court stayed the operation of the judgment for 15 days in order to get reasonable time to file appeal. The parties are directed to maintain status-quo with regard to the services conducted by both parties. No judgment or any verdict was issued from any Honorable Court to restrain H. E. Dr. Mathews Mar Severios Metropolitan from exercising His Eminence’s Episcopal authority and celebrating Holy Qurbana at Kolenchery church. Antelias (Lebanon), 2011 September 23: During the week His Holiness Aram I went to Armenia for three days (19-21 September 2011) to take part in the 20th anniversary celebrations of the independence of Armenia. Catholicos Aram I was the guest of Catholicos Karekin II in Etchmiadzin. 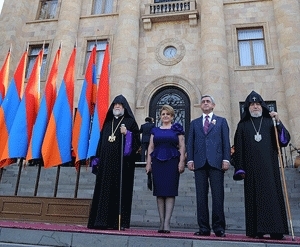 At the celebrations the two Catholicoi greeted the people and transmitted their messages emphasizing the important contribution of the Armenian Church in building national and spiritual values. Throughout those three days His Holiness Aram I was also invited to address issues challenging the Armenian people and the Church. 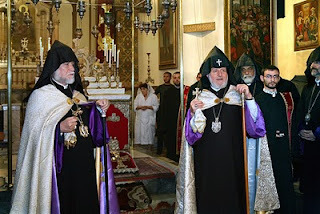 Mother See of Holy Etchmiadzin, 19 September, 2011: In the evening of September 18, His Holiness Karekin II, Supreme Patriarch and Catholicos of All Armenians, welcomed His Holiness Aram I, Catholicos of the Great House of Cilicia to Armenia in the Mother See of Holy Etchmiadzin. His Holiness Aram I, is visiting to participate in the events dedicated to the 20th anniversary of the Independence of Armenia, with the Catholicos of All Armenians. At the airport, Catholicos Aram I was met by His Eminence Archbishop Grigoris Buniatian, Primate of the Armenian Diocese of the Ukraine, His Eminence Archbishop Komitas Ohanian from the Catholicosate of the Great House of Cilicia, as well as by the Members of the Brotherhood of the Mother See: His Grace Bishop Nathan Hovhannisian, His Grace Bishop Artak Tigranian, Rev. Fr. Mushegh Babayan and Rev. Fr. Mkhitar Grigorian. Under the ringing of the bells of the Mother Cathedral of Holy Etchmiadzin, the Catholicos of All Armenians and the Catholicos of the Great House of Cilicia were led to the Mother Cathedral from the Pontifical Residence, where a Prayer of Thanks was offered in front of the Holy Altar of Descent. In his remarks, His Holiness Karekin II welcomed Catholicos Aram I and the members of the Brotherhood of the Catholicosate of the Great House of Cilicia, “The occasion for your visit is beautiful: you have come to participate in the events dedicated to the 20th anniversary of independence of the Republic of Armenia. In honor of this milestone, we will participate in the events and extend our message and guidance to our faithful sons and daughters, encouraging them in their love towards the Homeland, so that they will continue their service with dedication and commitment for the welfare and prosperity of our nation”. Reflecting on the independence of the Homeland His Holiness stated in part, “Our Church has always nourished the spirit and idea of freedom to our offspring, and preserved the aspiration of Armenian statehood. We extend our glory to God that today it has become a reality, and that our Church stands on the foundation of that achievement. Today we, along with you, testify with our presence, that the Holy Armenian Apostolic Church will continue to assist the Homeland with Her works and endeavors, benefiting the welfare of our nation, as well as the Armenian offspring worldwide, in the efforts of creating a blessed, God-pleasing and prosperous life”. The Catholicos of All Armenians expressed his wish that the Lord keep the Pontiff Aram I in good health, and grant him success in all his endeavors for the welfare and prosperity of national life and the Holy Armenian Apostolic Church. His Holiness Aram I Catholicos of Cilicia expressed his feelings on his visit to the Mother See of Holy Etchmiadzin and the meeting. 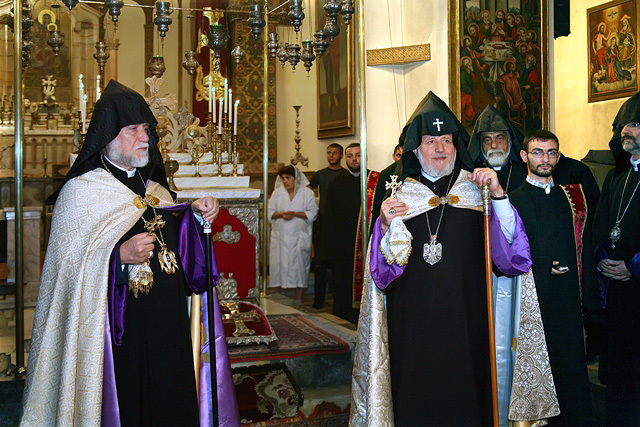 Pontiff Aram I stated his wish that God keep the Mother See of Holy Etchmiadzin unshaken, granting success to the Church-building activities and vibrancy of the Holy Armenian Apostolic Church. The welcoming service ended with blessings and the Lord’s Prayer by the Catholicos of All Armenians and the Catholicos of the Great House of Cilicia. Kochi, 20 September 2011: A petition by the Rebel Jacobite Syrian Christian Church (dissident Patriarchal group) seeking status quo of rights at the disputed church in Kolenchery was Tuesday 20th September 2011 denied by the Kerala High Court. A Division Bench comprising Justice Thottathil B Radhakrishnan and Justice C T Ravikumar denied to stay implementation of the earlier court order which was in favour of the Orthodox Syrian Church. A tense situation has been prevailing in Kolenchery between the Rebel Jacobite Syrian Christian Church and Orthodox Syrian Church fighting for the ownership of St Peters' and St Paul's church. The new petition was filed after two rounds of negotiation to get the two feuding factions compromise failed. During the court hearing, the government pleaded that both the parties have to maintain law and order and the orders issued by the court should ensure that. The court held that maintenance of law and order is a matter of the executive and only in exceptional circumstances it becomes necessary for judicial compulsion to ensure it. Earlier, negotiations by the district administration and court-appointed mediators failed to bring a resolution in the matter with the Orthodox church pushing for an early implementation of the court order. Trouble erupted last week after a recent court order handed over complete control of the church to the Orthodox church. An interim order declared by the Church Court in December 2007 had declared that Sunday masses at the disputed church should be conducted in a ratio of 2:1 favoring the Orthodox church. KOLENCHERY, Kerala (India): The Orthodox Church of the East had called off its protest on Sunday18th September night with Catholicos of the East His Holiness Baselios Paulose II calling off his eight-day fast at Kolencherry. “We backed out from open protest considering the request of the District Collector. He has given us a written assurance that the issue would be solved in two weeks, if not the court order would be executed,” said Fr Johns Abraham Konat, priest trustee of Orthodox Church. Following this, His Holiness Baselios Marthoma Paulose II , the head of Orthodox Syrian Church of the East, concluded his fasting late on Sunday. “The Synod Council and Managing Committee of the church will meet on Wednesday and Thursday respectively. The meeting of these high level committees will take a decision on the future course of action,” said E C Elias, secretary, Orthodox Syrian church. The supreme head of the Orthodox Church, H H Baselios Marthoma Paulose II was on an indefinite fast since Sunday Sept. 10 evening, demanding execution of the court order which allows the Orthodox Church to have the ownership of the Sts. Peter and Paul Church, Kolencherry, and the Kottoor chapel under it. Mediations and requests by Kerala Chief Minister Oommen Chandy helped in alleviating the deteriorating situation in Kolencherry. Oommen Chandy, on Sunday18th September sought 15 days time from the Orthodox Church and parallel Jacobite Syrian Christian Church (Dissident Patriarchal faction) to solve the dispute over ownership of the Sts. Peter and Paul Church, Kolencherry, and the Kottoor chapel under it at Kolencherry in Ernakulam district. Honb’le Chief Minister Oommen Chandy made the appeal after marathon meetings with the representatives of the parallel Jacobite Syrian Christian Church and Orthodox Church. Earlier Chandy had held discussions with union government ministers of India Vayalar Ravi, K V Thomas and district administration and senior police officers. If within two weeks a solution is not in sight, court orders would be implemented, he said. Chandy also urged the supreme Catholicos of the Orthodox Church and Regional Catholicos of parallel Jacobite Syrian Christian Church group to end their agitations. A meeting of the action council of the Orthodox Church, which is demanding implementation of the district court order, at Kolenchery on Sunday18th September night has decided to accept Chief Minister’s request. Following this, His Holiness Baselios Marthoma Paulose II, the head of Orthodox Syrian Church, and H.E. Dr. Mathews Mar Severios Metropolitan(Kandanad East) concluded their fasting late on Sunday. Both of them decided to end the fasting by 11.30 p. m. on Sunday 18th September by receiving karikinvellam from H.E. Thomas Mar Athanasius Metropolitan (Chengannur) and H. E. Dr. Thomas Mar Athanasios Metropolitan (Kandanad East), the president of the core committee which was entrusted to lead the Upavasa Prarthana Yagnam (fasting prayer sacrificing program). Chief Minister Oommen Chandy gave leadership to the discussions which finally culminated in the ending of the fasting. The decision came after His Holiness received a written assurance from the side of the Government that the Court order will be implemented after 15 days. A last attempt will be made during these 15 days to solve the issue amicably. If no result comes out from these discussions, the Government will implement the court verdict. This decision of the government was written and signed by the Ernakulam District Collector for the Government of Kerala. The Orthodox Church received the document by 11 p.m. which was scrutinized by their advocate Sreekumar and the bishops of the church present at Kolenchery. After getting the consent of all, H. H. declared that H. H. is ending the fasting. The St Peter’s and St Paul’s Church, which remained closed for several years, was opened in 2010 following the Ernakulam district court intervention. The district court in December 2, 2010, released the key to Fr. Jacob Kurian, a priest belonging to the Orthodox Church and granted permission to the two factions to conduct service. The Orthodox Church was conducting the services for two consecutive weeks and the parallel Jacobite faction for the third week. This arrangement was prevailing as on August 16, 2011 when their suit was dismissed. On August 16th 2011 the district court handed control of the parish to Orthodox church rejecting all pleas and false claims from parallel Jacobite side and declared the parish is an integral part of Malanakara Orthodox Syrian church and shall be governed under the Church constitution passed in 1934. The parish comes under the Kandanad West diocese. On August 16th His Eminence Dr. Mathews Mar Severious, the Metropolitan of Kandanad west celebrated Holy service peacefully in the parish. The trouble began on Saturday 9th September with the parallel Jacobite Syrian Christian group holding protest marches demanding status quo at the Kolenchery St. Peter's & St. Paul's Church. Under the status quo ante, the parallel Jacobite group were allowed to offer Mass every third Sunday. Regional Catholicos of parallel Jacobite Syrian Christian Church group Baselios Thomas I had demanded the restoration of status quo ante and led a protest sit-in near the Church on Saturday afternoon. The protest was called off late in the night. Tensions started on Sunday 10th September when the police blocked the Metropolitan His Eminence Dr. Mathews Mar Severious and other priests from entering the parish and celebrating the Holy Mass. Police vacated all of Orthodox members presented in the church on Sunday. The Sts. Peter and Paul Church, Kolencherry, and the Kottoor chapel under it have been closed down temporarily and prohibitory orders under Section 144 Cr.PC declared around these institutions. It was on Sunday 2.30 pm that RDO R Maniyamma declared curfew as per district collector's direction. The Orthodox Church has criticized the closure of the Church and described it as a conspiracy by the Chief Minister and the District Collector. The Orthodox Church, under the leadership of His Holiness Baselios Mar Thoma Paulose II, started fasting 200 metres away from Kolenchery St. Peter's and St. Paul's Church (where curfew has been imposed) around 4 pm on Sunday. 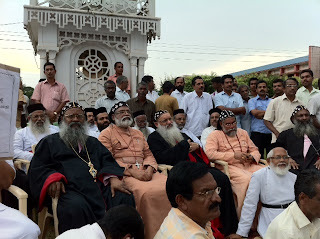 Meanwhile, the parallel Jacobite Syrian Christian Church group under Regional Catholicos Baselios Thomas I began an indefinite protest prayer at 6 pm near the shrine at Kolenchery Junction against a recent order of the Ernakulam District Court that hands over the administration of St. Peter's and St. Paul's Church at Kolencherry to the rival Orthodox Church and demanding that status quo should be maintained. An urgent meeting of The Malankara Orthodox Syrian Church Working and Managing Committee was held on September 13th and decided to call an urgent meeting of Malankara Syrian Christian Association, which was held on September 15th to discuss the situation and unanimously decided to continue the indefinite fasting until the court order is fully executed. Protest meeting are arranged in all diocese in Kerala under the leadership of Diocesan Metropolitan’s and Diocesan council. While the Orthodox Church decided to call off the agitation following the request from the Government of Kerala on Sunday18th September, The parallel Jacobite faction has not decided to withdraw the protest against a recent order of the Ernakulam District Court that hands over the administration of St. Peter's and St. Paul's Church at Kolencherry to the rival Orthodox Church. The parallel Jacobite faction is holding the indefinite protest prayer at Kolenchery parallel Jacobite Syrian Christian chapel. London,17th September, 2011 (britishorthodox.org): Abba Seraphim expressed his condolences at the news of the death of His Eminence Metropolitan Domadios of Giza, who died on 16 September at at El-Salam Hospital in Mohandessin, Giza where he was under treatment. Pope Shenouda along with 37 metropolitans and bishops and 3,000 people led the funeral office. The funeral was attended by the Vatican Ambassador to Egypt, the Minister of Interior (General Mansour al-Issawi) and the Governor of Giza. Born as Michael Khalil on 9 July 1925 at Maghagha City (Minya Governorate), he completed his high college and spent his early and primary school Bmgagh then moved to complete his secondary education school at El-Masai El-Mashkura College in Shebin El-Kom. On 1946, he received his his bachelor’s degree from the Faculty of Agriculture at Cairo University. He then studied a 2-years Education diploma (1948) to work as teacher of Agriculture in Tanta for two years. At the age of 15, he joined the church village ministry convoys in Giza. During his university studies, he started teaching Sunday School at St Mark’s Church in Giza. Michael Khalil was a disciple of Father Mi9na the Hermit (the future Pope KyrillosVI). On 29 April 1951, he was consecrated as a monk monk at the Syrian Monastery with the name “Fr Matthias”. As an Agricultural Engineer, he utilized his knowledge to improve the desert soil near the monastery and cultivate a farm. This was one of the earliest attempts to cultivate desert soil. On March 1953, he was ordained priest, then Hegoumen in April 1954 (which is remarkable as he was not yet even to his 30s). When Fr Mina the Hermit was consecrated as Pope Kyrillos, Fr Matthias joined his secretariat. The former sent him in 1962 to support the growth of St Mina’s Monastery at Mariut. At the same time, Pope Kyrillos nominated him for the episcopate, which he refused. 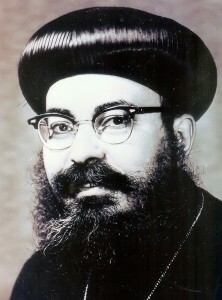 However, the Holy Synod selected him to become the Bishop of Giza and Pope Kyrillos consecrated him as Bishop Domadios of Giza on 31 March 1963. 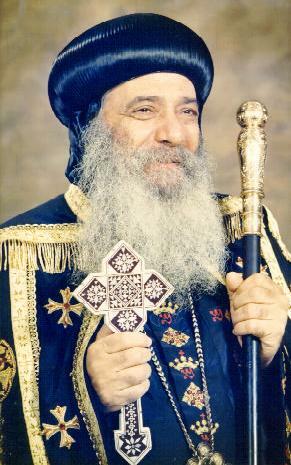 He was later promoted to the rank of Metropolitan by Pope Shenouda III on 2 June 1985. In his later years, Abba Domadios suffered from a stroke which left him partially paralysed and confined to a wheel chair for many years, but in 2009 Pope Shenouda consecrated Bishop Theodosius as a General Bishop to assist him. 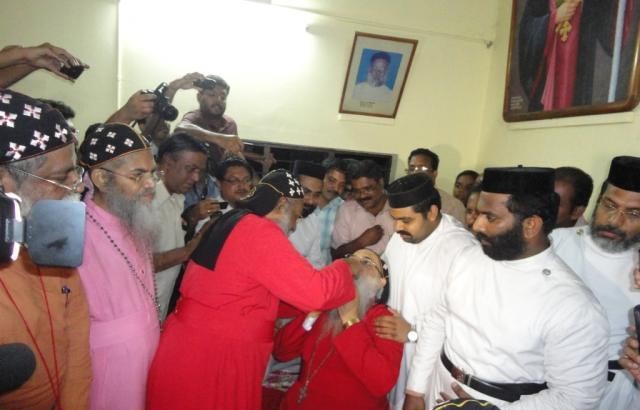 Kolencherry, Kerala (India): The oldest churches in India, the Syrian Orthodox Church of the East in central Kerala is in the grip of an intense feud. The fight between rival factions of the Malankara Orthodox Syrian Church is now spilling onto the streets. The bone of contention is the ancient church in Kolencherry, which both warring Orthodox and Rebel Jacobite factions claim as theirs. The trouble has become worse, after a recent court order, which handed over control of the church to the Orthodox Church headed by Catholicos of the East H.H.Beselios Paulose II. Trouble began when the Orthodox Church decided not to share ownership of the church with the rivals, preventing them from entering the premises. The Orthodox faction demanded that the Rebel Jacobite faction abide by the district court order. The dispute over the right to worship further led the head the Orthodox Church, HH Baselios Marthoma Paulose II to launch a hunger strike on Sunday. Not budging from its stand, the Jacobite faction under Catholicos H B Baselios Thomas I as well began a prayer strike programme near the shrine. The Orthodox Church wants the government to implement the court order immediately. Father Dr K M George from the Malankara Orthodox Syrian Church says, "There is a clear court verdict. If the government implements the order, the matter will be solved." But the Jacobite faction say they cannot be ousted from the church. Geevarghese Mor Coorilos from the Rebel Jacobite Syrian Christian Church says, "We have been worshiping here for ages. We cannot be suddenly told that you have no right here and you should go away and build a new church." The church is believed to be the shrine of St Peter dating back to the 7th century. It is considered holy to both factions of the Malanakara Church. But after the skirmishes between the two groups, it has now been closed for worship. There are concerns that if a settlement is not reached soon, the tension between two groups will flare up. Since there have been violent clashes between the two factions in the past, police have been deployed in large numbers to prevent any violence. With tensions rising believers say it now time to end the hostility. 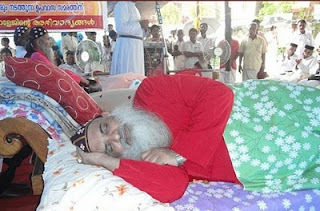 Joseph Zachariah a devotee of the Orthodox Church says, "I think this is disgraceful for the entire Christian community. What we need is an amicable settlement. We should end all this." A curfew was Sunday declared at the tension-gripped Kolenchery.The district collector meanwhile has sought the intervention of the mediation cell of the High Court to resolve the dispute. District Collector P I Sheik Pareeth told the court that the dispute had become a law and order issue and would worsen with more people joining the protests. CAIRO, September 9, 2011: Pope Shenouda III, the head of Egypt's Coptic Orthodox Church, returned home Thursday 6th September 2011 from a trip to the US and Hungary, where he received treatment and opened a new church, the official Middle East News Agency (MENA) reported. MENA added that the Pontiff was in good health after some check-ups in the US, followed by his trip to Hungary, where he was awarded an honorary doctorate and inaugurated the Virgin Mary and Archangel Michael Church in Budapest. A ceremony was held to welcome Pope Shenouda, as he arrived at his headquarters at Saint Mark’s Cathedral in el-Abbasiya (Abbasseya) neighborhood of Cairo after his 19-day trip. He told those present at the ceremony that he was in good health. A police officer tried to ban journalists from entering the Church's headquarters but eventually withdrew when the reporters threatened to stage a sit-in, Emad Khalil Of almasryalyoum.com reported. In related news, Sherif Doss, president of the Coptic General Authority, called on all Coptic candidates in upcoming parliamentary elections to coordinate with the authority regarding their electoral campaigns. This is the text of the letter that His Holiness Aram I Catholicos of Cilicia sent to H.E. Recep Tayyip Erdogan, Prime Minister of Turkey. We read in the press of your government's decision to return properties seized from religious minorities in Turkey since 1936. Undoubtedly, this deci¬sion was an attempt to respond to recent developments at the European Court of Human Rights and to the US Congressional scrutiny of Turkey's repression of its Christian minority. As the spiritual and legal Head of the Armenian Catholicosate of Cilicia, uprooted from its centuries-old seat and established in Antelias, Lebanon, and as the representative of the faithful of the Armenian Orthodox Church, also ex¬iled from Turkey and dispersed all over the world, we find your decree of Saturday 27 August 2011 partial and unjust. The Armenian Catholicosate of Cilicia still holds the titles of ownership of several churches, hospitals, schools, orphanages, cemeteries and other church properties that were confiscated by Turkish authorities during the Armenian Genocide of 1915. The Armenian peo¬ple still keep the titles of ownership of the homes, businesses and lands they in¬herited from their grandparents who were victims of the Genocide planned and executed by the Ottoman-Turkish government of the time. The current decree of your government may comply with European Union standards, but is not an act of justice. Mr. Prime Minister, selective acts of justice deny history and negate democratic values and principles. International instruments such as the European Court of Human Rights and Congressional and parliamentary bodies are implementers of democratic values and principles, and the people are their conscience. As Fridjof Nansen, the High Commissioner of the League of Nations (1921) and Nobel Prize winner, wrote in his well-known book, Armenia and the Near East (London, 1928), "The Armenian people have never abandoned hope; they have gone on bravely working, and waiting. They are waiting still…" (p. 324). And I would add that they will never stop demanding justice from Turkey for the Armenian Genocide; and they will never stop de¬manding the restoration of their human rights. Mr. Prime Minister, your claim for justice and human rights will be credible only if you recognize the Armenian Genocide. Human resources is the indicator of a nation's or community's inner power and creative mind and a guarantor of its bright future. The Armenian Diaspora is rich with human resources. It is vitally important that we get a clear, accurate and comprehensive information about our human resources in the Diaspora. Indeed, "Information is power; and the power of knowledge and information becomes a source of deeper self-understanding and self-affirmation" according to His Holiness Aram I, Catholicos of Cilicia. The Armenian Catholicosate of Cilicia has initiated a program aimed at gathering information about our human resources in the Diaspora. By human resources we basically mean: community leaders, clergy, economists, people of media, writers, politicians, artists, public figures, medical doctors, teachers, university lecturers, businessmen, and generally specialists in the area of science and technology, etc. This initiative has the full support of His Holiness. Thus, we kindly ask you to fill in the Form and submit it to the Catholicosate, Antelias, Lebanon. We also ask you to forward this e-mail (with the link http://www.armeniancatholicosate.org) to your friends.